The newest two time-zone Parmigiani Fleurier, the Toric Hémisphères Rétrograde. The 42.8 mm case is made with 22K rose gold in a polished 3 piece construction case. It uses the iconic knurled bezel, which is the signature of the Toric family. Apart from the size, the case aesthetics does remind us of the Rolex Cellini. Fit with a non-symmetric open caseback, the case also uses Sapphire Crystal on the front and back. Overall, the construction and finishing of the case is top-notch, with nicely polished lugs and a fascinating step bezel. The rose gold crowns bear the Parmigiani logo, elegant with its well-defined cut grooves. The watch measures 42.8 mm in diameter and is cased in 22K rose gold. 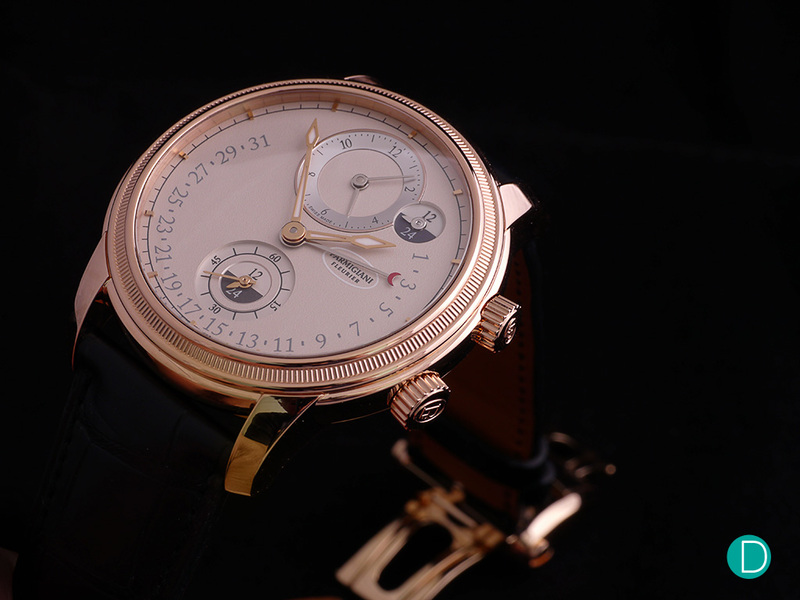 The white grained dial is lined with a minutes track and rose gold gilded indices. The watch uses a white grained dial that is almost a tinge of cream. 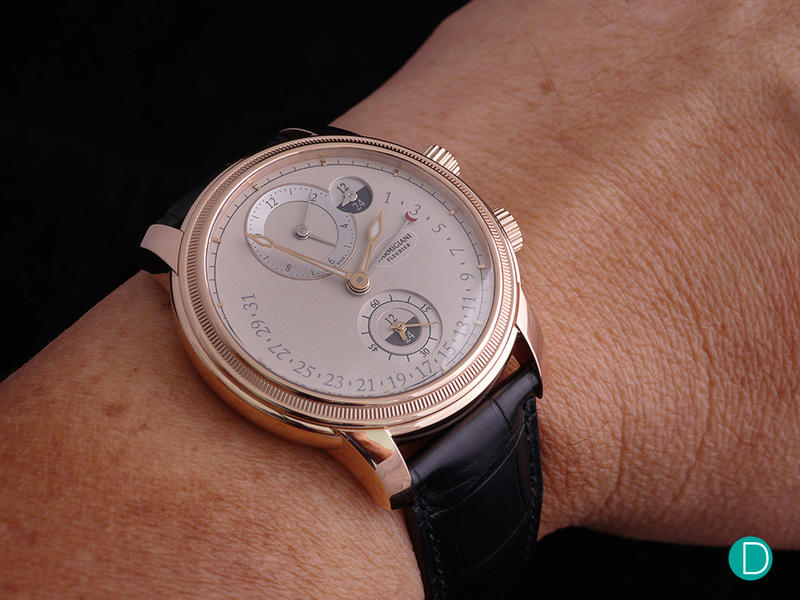 It is lined with a minutes track and rose gold gilded indices on the periphery. The dial is balanced and maintains a good legibility, critical of a classic ‘tool’ watch. A pair of javelin hands are used to display the main time, which is set by the crown at 4 o’clock. The secondary time zone is shown in the 12 o’clock subdial, and set via the crown at 2. Accompanying both is a pair of 24 hour indicators, that functions like a day/night indicator. The sunken subdials and indicators add complexity to the dial maker’s craft, and is well-executed and a delight to admire. A contrasting display between the subdial at 6 and the subdial at 12 also adds a good twist to the dial for some lightheartedness. 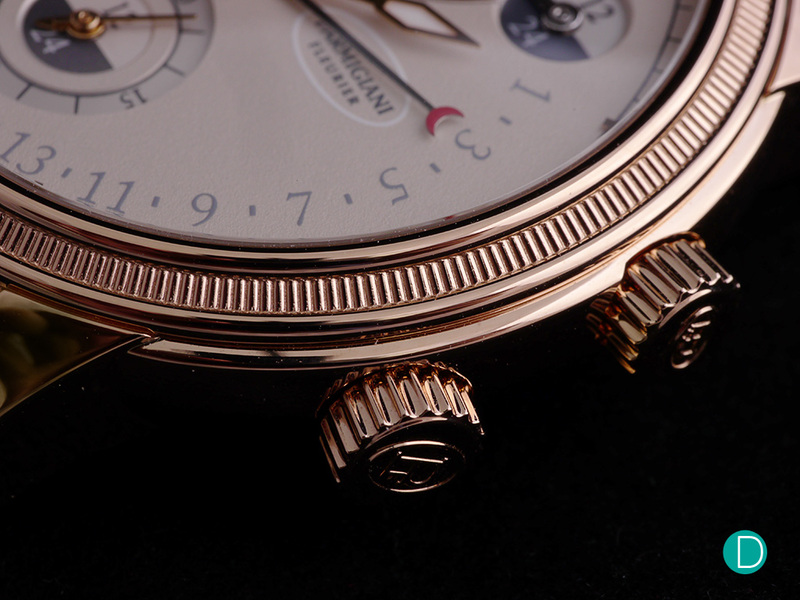 The case features a knurled bezel, the signature of the Toric family. The open case reveals the PF317 movement, a 4 Hz self-winding caliber with 50 hours power reserve. The Parmigiani Fleurier Toric Hémisphères Rétrograde uses the PF317 movement, a 4 Hz self-winding caliber with 50 hours power reserve. 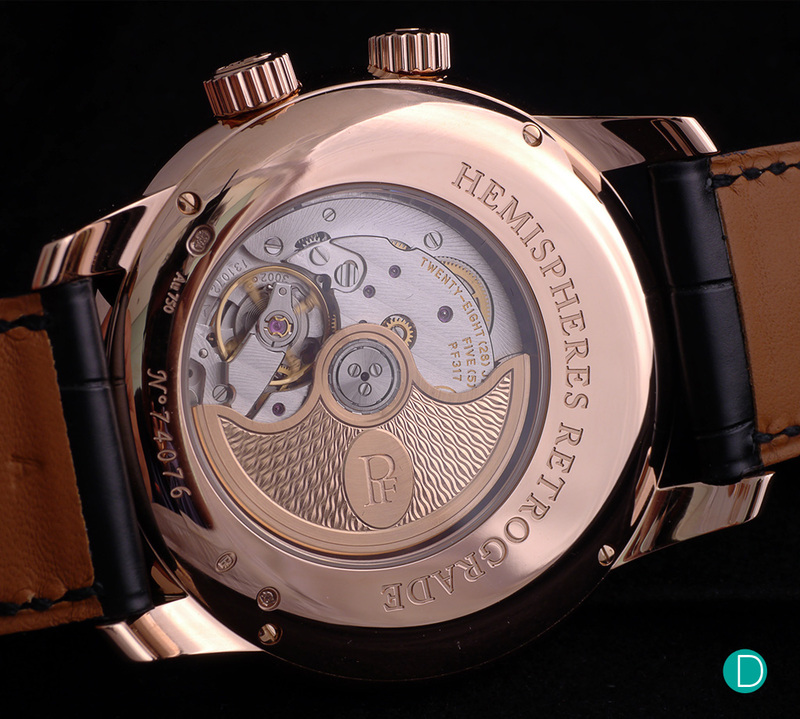 The base caliber was first used in the Tonda Hémisphères in 2010 and was a world first. In 2017, the dual time movement is now used in the Toric collection and with an added Retrograde date. 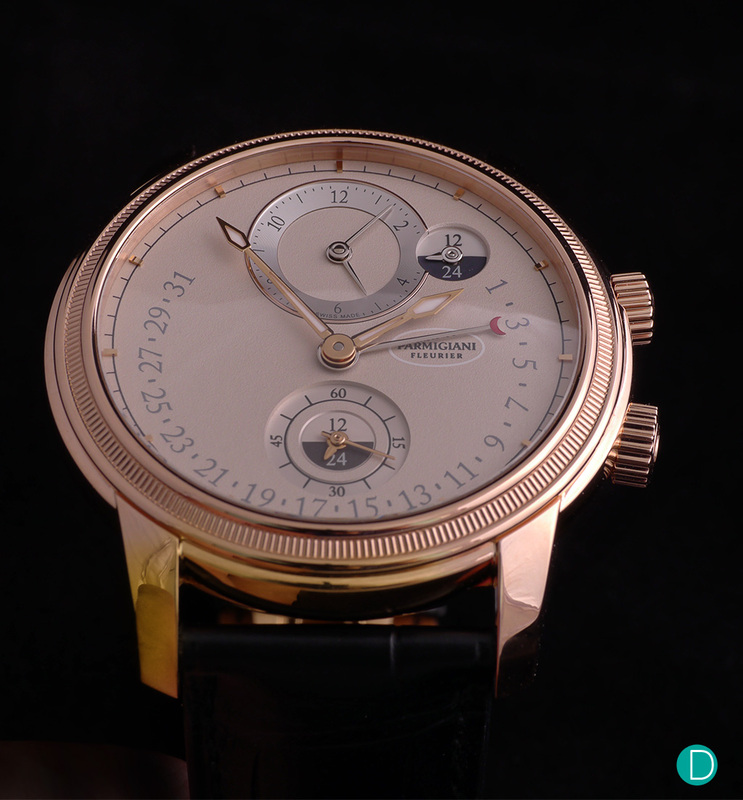 What remains fascinating about the movement however, is how a single movement can be used to display two independently adjustable (to the minutes) timezones in the case size of one watch. 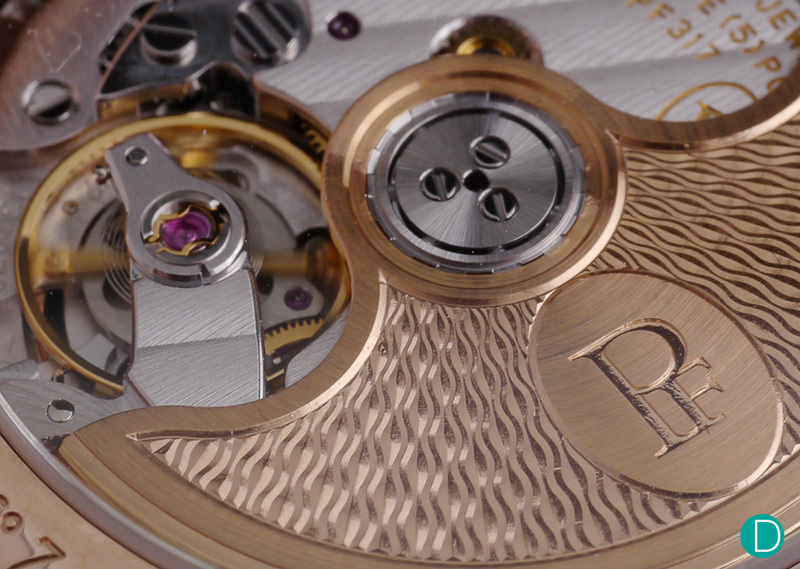 The movement is finished with Côtes de Genève decoration, bevelled edges and a patterned hand engraved gold rotor. 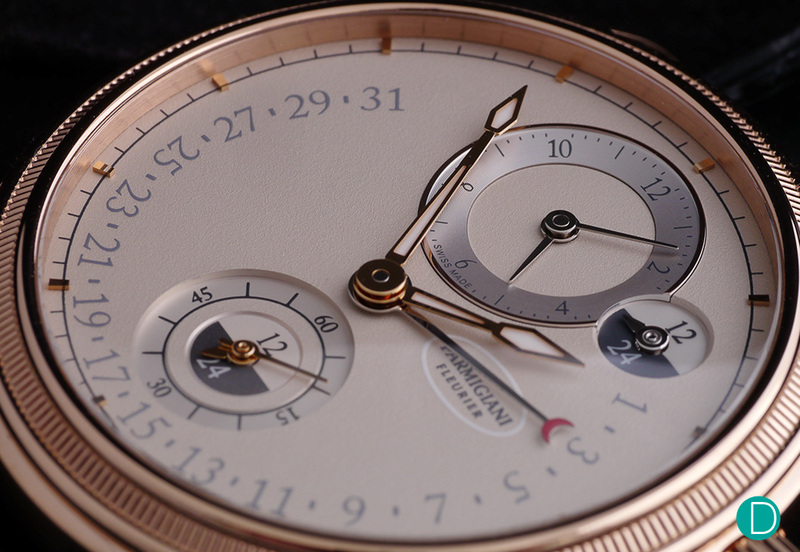 The finishing of the movement is aesthetically pleasing and fitting at its pricepoint. The fundamental Côtes de Genève lines, bevelled edges are present, although the lack of finesse relative to more expensive models is apparent. A palatable size on the wrist, with a highly legible dial for a quick time check. Overall, we find that the Parmigiani Fleurier Toric Hémisphères Rétrograde is easily the most legible and functional travel watch in the market today. Although there are many ‘travel’ watches in the market, the Toric Hémisphères Rétrograde is almost in a class of its own. Several notable travel timepieces like the Rolex GMT master and the Jaeger leCoultre Reverso Duo are only equipped with an adjustable secondary hour display, which makes it pointless for timezones with 30 minutes or 15 minutes variance. Other offerings in the worldtimer category, like the Chopard L.U.C Time Traveller only caters to 24 timezones. While the Vacheron Constantin Overseas Worldtimer covers all 37 timezones, its display (being a worldtimer) is visually more cluttered as compared to the Toric Hémisphères Rétrograde.